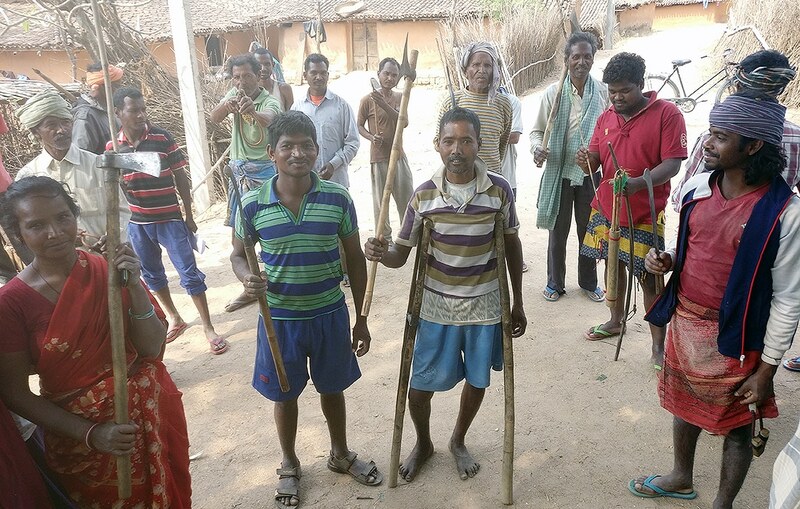 News18 takes you inside the Adivasi-led exclusionist movement spread across hundreds of tribal villages in several states, including Jharkhand, Odisha and Madhya Pradesh. It’s early morning on March 4. Thousands of men, women and children from 30 villages are swarming all over Sonpur, a tribal hamlet located deep in forests, around 100 km from the nearest city—Ranchi. In around three hours from now, Sonpur will declare self-rule. The village is hosting a Patthargarhi (installation of stone) ceremony, at the conclusion of which it will constitute a gram sabha, swear to boycott elections, stop sending its children to government schools and promise not to enroll for any government identification, including voter ID and Aadhaar. Besides, state police and elected representatives will not be allowed in these villages anymore, non-Adivasis too will have to take permission before entering Patthargarhi villages; those who are allowed in will have to pay toll tax. And a vigilante force would be constituted to combat the security forces when need be. In the process, Sonpur will become the 60th village in this district to declare autonomy. The invitees—thousands of tribals from nearby villages—armed with sickles, bows and arrows, machetes, crossbows, and axes, look prepared for a war. The ceremony due in Sonpur, a short while from now, has not only been conducted in 60 other villages of Khunti district and adjoining districts of Simdega, Gumla, East and West Singbhum, and in villages around Ranchi, but has happened, over the last one year, in hundreds of other villages in states like Madhya Pradesh and Odisha, which have significant adivasi population, and where News18 travelled for this story. 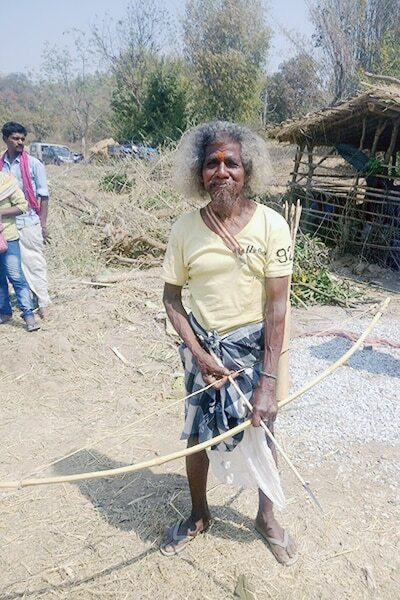 A popular WhatsApp message, in groups actively engaged in Patthargarhi, goes, “Na Hindustan, na Pakistan...hame chahiye Adivasistan.” A tribal MLA from Odisha’s Birmitrapur, George Tirkey, who is leading Patthargarhi drive in his state, says he wants to create a special ‘adivasi corridor’. 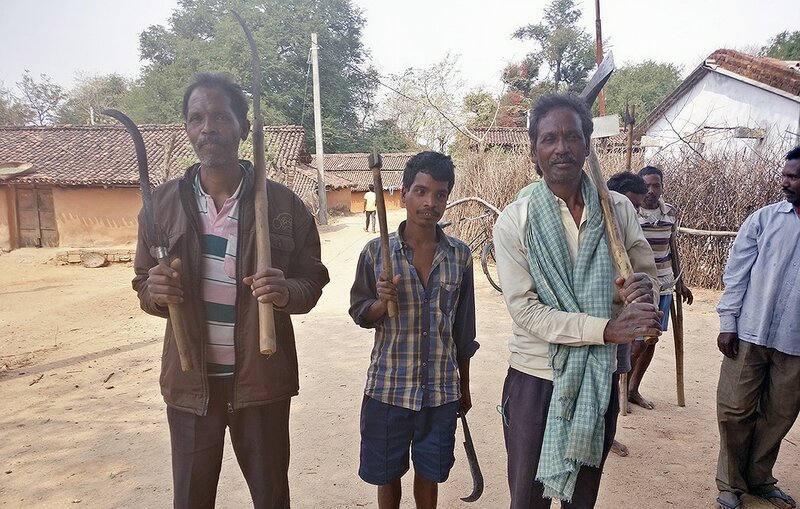 Intelligence and administrative officials have their own versions of why this armed rebellion is mushrooming in their areas—officers in Jharkhand claim Patthargarhi to be a front for illegal poppy cultivation aided by Naxals; in Odisha and Madhya Pradesh the political opposition is privately held responsible for using Patthargarhi as a weapon against the parties in power. But what is similar in all these areas, is that thousands of Adivasis, who often have very little in common with each other, who are angry with being left behind by the state and being pushed around by industries, have found in Patthargarhi a unifying expression of dissent. Propelling this movement is an outlandish conspiracy theory, based on some forged documents, supported by a misinformed reading of the Constitution. According to it, Adivasis have Constitutional authority to declare self-rule in areas they dominate and they enjoy a lot of special, extra-judicial powers. “Ab saansad aur vidhayak ka pravesh bhi yahan varjit hai [MPs and MLAs are also not allowed in these villages anymore],” says a local from Kunti’s Bhandra village. Some of the tribal leaders responsible for the Patthargarhi drive claim to have learnt these theories from Sati Pati ashram in Gujarat. The ashram, started by a man named Kunwar Kesri Singh—who called himself ‘Owner of India’, has for last several years been advocating these theories, urging people to not pay taxes and prohibiting local tribals from getting official documentation. “People, including those from Jharkhand, keep coming to us for education all the time, we can’t keep tab on all of them. But it is true that certain awareness has come to our brothers in a few other states and we’ll continue to spread this awareness,” Sandeep Vasava, one of the members of ashram, based out of Sagbara said. 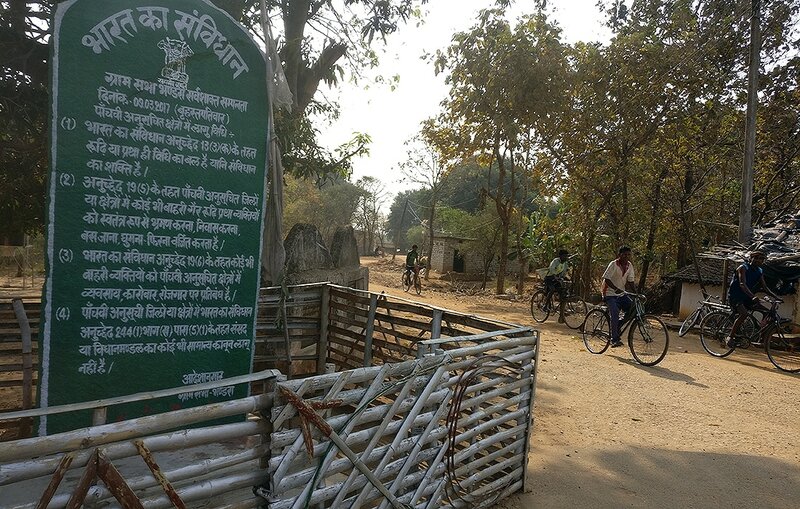 The stone in Sonpur that is about to be inaugurated reads that non-Adivasis are from now on prohibited to enter this village, and laws passed by Parliament or legislative assemblies don’t apply here. The stone claims that all identification cards—Aadhaar, voter ID, etc—are anti-adivasi documents. And that Adivasis are actually the rulers of India, not ordinary citizens on whom Indian laws like The Indian Penal Code (IPC) and The Code of Criminal Procedure (CrPC) apply; that in this country gram sabhas are constitutionally placed higher than electorally appointed institutions like Parliament or legislative assemblies. “Na Lok Sabha, Na Vidhan Sabha, sabse upar Gram Sabha,” goes one popular slogan. “Kaaghaz ka tudka fat jaata hai, computer short circuit ho jaata hai. Magar ye patthar kahin nahi jaayega. Hamari aane waali naslein bhi isse sabak lengi (A piece of paper can be torn apart, computers can short circuit. But this stone will not go anywhere. Even the generations after us will learn from this stone),” says Joseph Purti, a senior tribal leader, and the chief guest at Sonpur. Known more popularly as ‘Professor’ and ‘Yusuf’, Purti and his associates from Adivasi Mahasabha are some of the most wanted men in Jharkhand right now, but police have refrained from arresting them fearing large-scale backlash from local Adivasis, who have for the past few months been regularly clashing with police. In August last year, over 100 policemen, including Khunti Superintendent of Police and 50 CRPF personnel, were held hostage for 12 hours by thousands of angry Adivasis after police forces tried to remove barricades put up by the locals to regulate the movement of people in Kanki—a Patthargarhi village. The security personnel were let go only after the intervention of the area deputy commissioner and DIG. "Na Lok Sabha, Na Vidhan Sabha, sabse upar Gram Sabha." “It is a struggle for our survival. The government is setting up more and more industries in Jharkhand and displacing more and more of us. They are diluting land laws and leaving us homeless. We are not educated so none of us will find jobs at these industries. 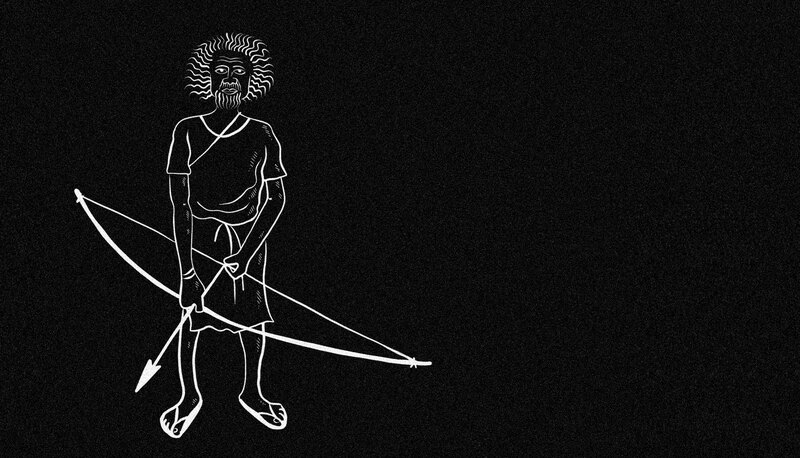 If we are left with no land, no money, and no jobs, how will we survive? We have been pushed to a point where we are ready to give or take lives if our Jal, Jangal, Jameen [Water, Forest, Land] are threatened,” says a local of Bhandra village, who was part of the mob that had held the policemen hostage. Stories of locals detaining policemen out on patrolling duty, who did not seek permission of gram sabhas in Patthargarhi villages before their entry, abound in villages around Khunti. Sagar Munda, a tribal leader from Kurunga village, says he, along with his friends, had detained a group of 25 policemen after hearing that their gram sabha leader was arrested the previous night. Only after their gram sabha leader was released did they let the policemen go. Back in Sonpur one person talks with pride about how Patthargarhi was done in his village despite all odds and in record time. “It was in Totpura village. It is located on top of a hill. There was no way such a heavy stone could have been carried to the top without a road. In one month, all the villagers got together, pounded plain a pathway, and then pulled a tractor all the way to the top,” he says as the audience listens with awe. While he talks, a group of women pass by. A few of them are armed, others are dressed for the day’s performance. The women also bring along children, quivers and bows hang loose from their shoulders. Joseph Purti arrives at slightly past 12 noon with a horde of bodyguards, some of who are armed with improvised crossbows made to look like AK47 assault rifles. Rows and rows of performers line up to give him a royal welcome. The performers dance for half a kilometre, pause as he inaugurates the stone, and dance for another half, leading him to his seat on the podium. While the speaker sets the tone for Purti’s speech, around 20 km from Sonpur, in Adki village, around a dozen villagers are sitting under a tree, discussing the ongoing events. “What is happening all around isn’t good. The truth is that they don’t know what they’re talking about. But it is also true that the government hasn’t delivered. Government teachers deputed to teach at our schools rarely turned up. We don’t have potable water, no roads and no electricity. What's happening is quite unfortunate," says a village elder. "A piece of paper can tear apart, computers can short circuit. 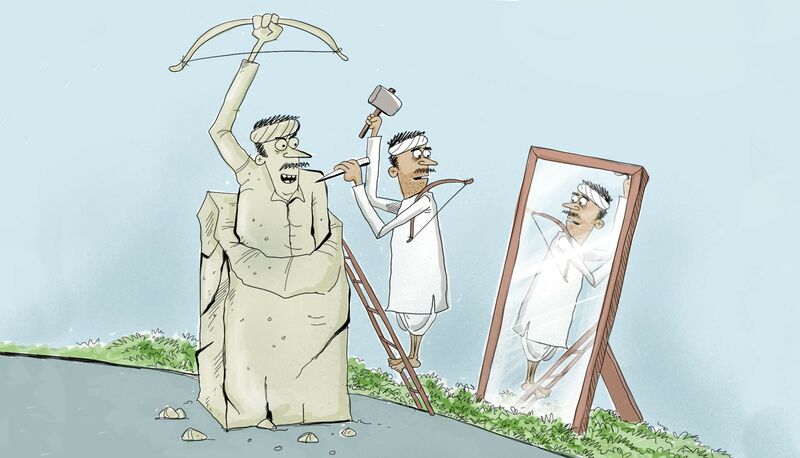 But this stone will not go anywhere." While claiming that the developmental works will be "fast-tracked" and put on "high priority", the district administration also says to be left with few options, which is why it has started a counter-propaganda exercise against the wild conspiracy theories fuelling the Patthargarhi movement. In an 'awareness' camp held in Kisan Bhawan in Adki, the Deputy Commissioner, Suraj Kumar, tells his audience of local villagers that the theories they're being fed on Constitution are false. “Some anti-national forces are trying to stir revolt. You shouldn't buy into these wild conspiracy theories. Are we being told that India never really achieved Independence and our local hero Birsa Munda died fighting the British in vain?" Singh says that he is preparing a document to counter the lies spread by anti-national forces which will be shared widely among villagers. “All this stir is being created to allow poppy cultivators to make money. The season ends in April. That's when their leaders will take their share and flee, and that's when we will move in," SP Ashwini Kumar Sinha tells News18. To a question about the possibility of Naxals being involved in Patthargarhi, Sinha says it is a possibility that the police isn’t ruling out yet. But the fact is that the administration is helplessly watching the unfolding of an armed rebellion by Adivasis, who constitute 26% of the state's population. A senior police official, who did not wish to be named, was asked by News18 about the duration for which the police expected the movement to continue. He chose to answer the question indirectly. “One of my seniors, who dealt with the Naxal situation when it initially broke out, had told me that any armed movement usually has a 20-year period when it rises and ebbs, after that it is replaced with something else.” He refused to say anything more. Sukharam Mundu starts the day’s class with Hindi. He begins with the letters, from ‘Ka’ to ‘Cha’, exemplifying their usage with sample sentences. One by one, all 15 students in his class, come up to the blackboard, and with some prodding from the teacher, read this out. The teacher goes on teach "Ja se Jameen. Sampoorn desh ki jameen adivasiyon ki hai...Ba se Buddhimaan. Adivasi buddhimaan hote hain...Ma se Maalik. Adivasi log Bharat desh ke maalik hain...La se Lootera. Loktantra looteron ka tantra hai...Va se Vote. 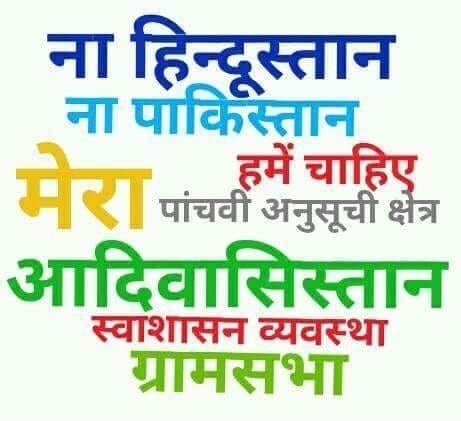 Vote vyavastha Hinduon ki hai." The students, from as young as 5 to as old as 12, who till last month used to study in various grades in local government schools, are now beginning their education all over again. 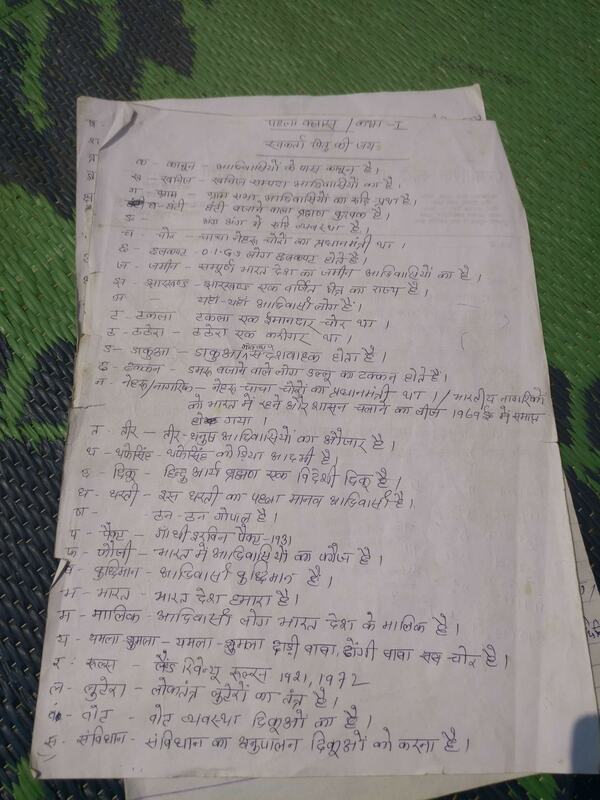 This is the first standard of the newly devised adivasi school syllabus prescribed by tribal leaders in Khunti, who have declared autonomy from India. The exercise of seeking autonomy from India started around a year ago in this district in Jharkhand through a ceremony. Sixty villages in this district alone have done Patthargarhi, which means they don’t recognise the government of India anymore, including its institutions like Parliament, legislative assemblies, identification cards and its education system. 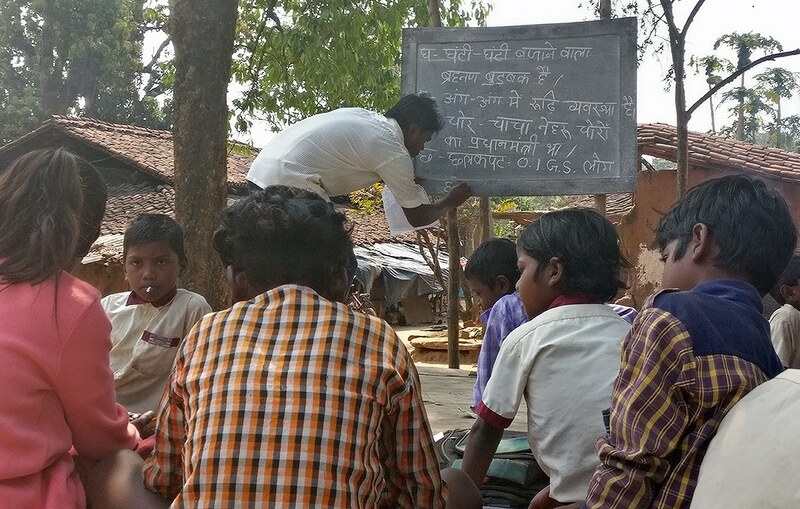 In other states like Odisha and Madhya Pradesh where Patthargarhi has just started, the tribal leaders are taking inspiration from Khunti and are busy compiling their own syllabi. Both students and teachers are being forced to take these classes. The students have been warned against attending government schools. Those who defy these orders are forced to pay Rs 500 per month as punishment, and those attending the quack schools are asked to pay Rs 50 per month as fees, both of which are huge amounts considering half of Khunti’s population is below poverty line. Mundu says he was ordered to leave his job as a teaching assistant with an NGO running free classes for underprivileged children. At the end of February he was handed a few pages, since the syllabus being composed by the autonomous leadership is still not ready, a blackboard and some chalk, and ordered to start teaching in village Udburu from March. Mundu may be too scared to come out and say how much his fixed Rs 5,000 salary meant to him and what a disaster he’s just been pushed to, not to talk about how his culpability in ruining the future of all these children who are devotedly memorising the nonsense he’s writing on the blackboard. But he just smiles and looks around and gets back to the blackboard. "Cha se chor. Chacha Nehru choron ka pradhanmantri tha." “Now let’s start the English class,” he tells the students. The notebooks his students are skimming through while their teacher writes a fresh set of letters and sentences on board, contain the remains of an education they till recently used to receive. Teachers’ red ink circling incorrect arithmetic and failed general knowledge quizzes. And so on, which includes "M se Maalik...V se Queen Victoria...X se Xenophobia". Mathematics and science are not taught at these schools since the tribal leadership is still deliberating on their syllabi. While students come one by one reading aloud what’s written on the blackboard, Mundu admits that keeping students from standard 5 and standard 1 in the same class is unfair to the seniors but he can’t move them around till further orders from the education committee. Three such schools, in Udburu, Jikilata and Uldi, are running in Khunti right now. 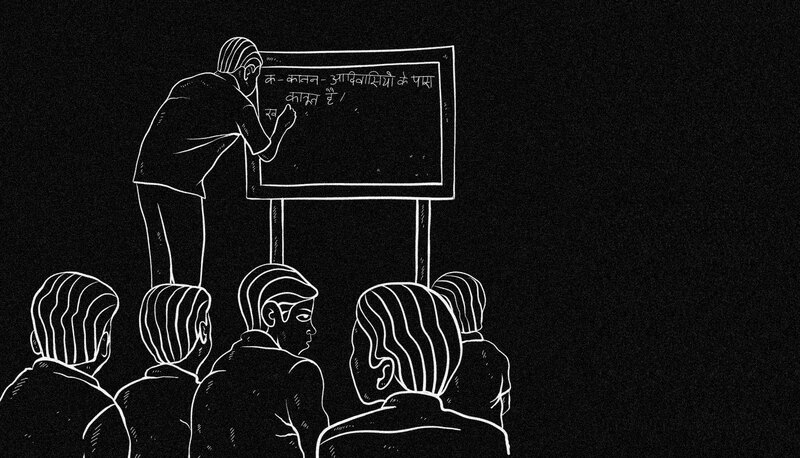 These schools now have students from over a dozen villages. The government schools and the teachers teaching there have been left with barely any students. 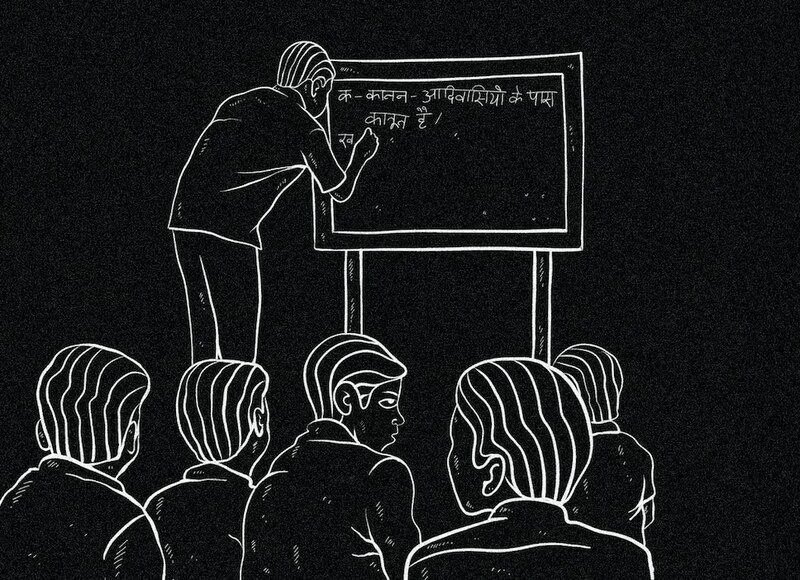 In Bhandra, for instance, a teacher deputed to the local government school says that the number of students in her class has dropped from 52 to 8 now. “How will we have students when families who have barely enough to eat are fined Rs 500 for sending their children to our schools? There are six schools here in Bhandra and all of them have more teachers than students,” says the teacher who did not want to be identified. Joseph Purti, a tribal leader, who has been organising the exclusionary Patthargarhi movement in Jharkhand and in other states says that the reason they’re not discouraging children from studying in government-run schools is because they teach nothing about adivasi history and their culture. “Why should we send our children to government schools? The books they have there don’t even mention us. They don’t teach our culture, our language. What good is this education to our children if they forget their own roots? 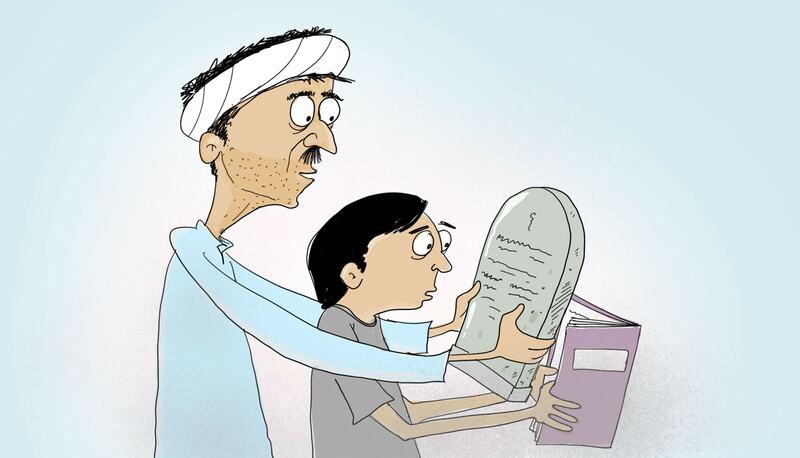 Our very existence has been obliterated from the annals of NCERT and CBSE syllabi,” Purti says. "M se Maalik...V se Queen Victoria...X se Xenophobia"
Tribal leaders in Odisha’s Sundargarh and Madhya Pradesh's Dindori agree with Purti. “While we aren’t withdrawing our children from government schools yet, but the government needs to include our history and language in their syllabi. Otherwise we will take over their schools and run them the way we want to,” says Baldev Singh Dhurbe, gram pradhan of Devri Kalan village, 90 kms from the nearest city —Jabalpur. Patthargarhi happened here five months ago. Birmitrapur MLA George Tirkey doesn’t see the contradiction when one points out that the Pathhargarhi movement he’s carried out in over 300 villages in and around Rourkela undermines his own position as an elected representative. The villages in which you’re carrying out Pathhargarhi don’t recognise the authority of the Parliament or the legislative assembly over the newly constituted gram sabhas. Doesn’t it undermine your own position as an MLA? “No. We still have to represent aspirations of the people who have voted me to power,” Jharkhand Mukti Morcha MLA Tirkey replies. But the Pathhargarhi villages don’t even acknowledge the presence of electorally chosen institutions. Besides, isn’t what you’re doing unconstitutional and illegal? “We have got powers to do what we’re doing because this is supposed to be a Fifth Schedule State. Also, we’re legally in the right. If this case comes up in court, we will surely win it hands down,” Tirkey says. Tirkey and some other local tribal leaders, leading the Pathhargarhi movement in Odisha, say they’re trying to create a special ‘adivasi corridor’ that will pass through Jharkhand, Odisha, Madhya Pradesh and Chhattisgarh. This corridor will supposedly be an autonomous or a semi-autonomous [depending on whom you speak to] expanse where Adivasis will have sweeping powers to govern themselves. Cases will be referred to gram sabhas instead of courts, and instead of police community armies will enforce law. “Adivasis will also have the final say over all the minerals, metals, stones etc that are dug out from these areas. The Adivasis should get at least half the share in profits, that is if the relevant gram sabha approves of the project in the first place. The gram sabha will also have the right to take back land from any industry at any time,” Tirkey’s associate Siprian Kiro says. In Rourkela, we’re sitting close to one of the biggest steel plants in the country. Could the local gram sabha ask the steel plants around to shut down? “Absolutely. But we’re not there yet. We’re getting to that stage,” Kiro says. How soon will we get to that stage? Again, this depends on whom you ask this question. Kiro and Tirkey represent the moderate face of Pathhargarhi movement in Odisha. While talking about autonomy, they also emphasise that they’re not advocating boycott of elections or for children to be taken out of government schools as is happening in Jharkhand. Tribal leaders like Baagi Lakda, who enjoy significant influence among Odisha’s tribals, want nothing short of an independent “Adivasistan”. 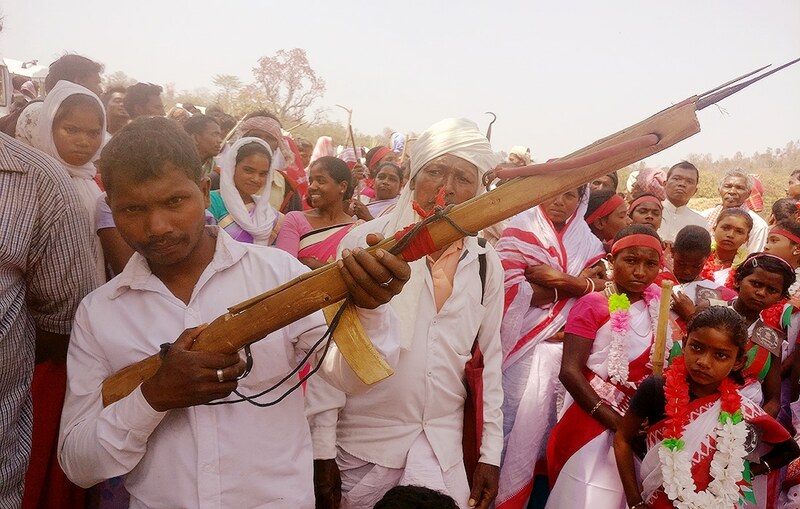 In February, he gathered around 5000 Adivasis from various tribes and called for removal of non-Adivasis, for 100% reservation in government jobs for Adivasis, and for cancellation of all business licences given to non-Adivasis. He is running a parallel Pathhargarhi movement in various districts of Odisha including Rourkela. Dozens of stones warning “outsiders” against trespassing in these areas have come up here over the past year. One local journalist puts the estimate at over 100. “We’re just starting out, but in time we will be heard. Even the President of India and the Prime Minister are servants of the government that we own,” Lakda says. Around 110 kms from Rourkela, in villages deep inside Sundergarh forests, Pathhargarhi is happening on an unprecedented scale. On Women’s Day, a Pathhargarhi stone is inaugurated for four villages—Bukpukada, Mahapada, Panchayatpada, Harijanpada—making them part of the autonomous Adivasi corridor. The stone inaugurated here after a purification ritual, says, “Any non-adivasi, Indian citizen is not allowed here; not allowed to settle here.” The powers to do this, the inscription goes on to inform, comes from Jagpal Singh vs State of Punjab Supreme Court judgment. "We have got powers to do what we’re doing because this is supposed to be a Fifth Schedule State. " “From now on no outsider, including police or even a politician, is allowed to enter these villages without seeking prior permission. And we will set up our own committees to run our villages — the education committee will decide what is taught to our children, the expenditure committee will decide what government schemes are implemented, and so on,” a villager proudly says. Some 500 kms from Sundergarh, in Madhya Pradesh’s Dindori district also, where Pathhargarhi has happened in scores of villages, there are talks over taking control from the government. Going by the accounts of the local tribals, the primary drive for Pathhargarhi is the clear disconnect between the capital and the countryside. “We should have control over which fund is spent where. Take for example what happened last week—the Chief Minister announced a metro train project in cities from funds meant for us. But what will we do with metro trains when we don’t even have water to drink or irrigate our crops with? When we don’t have canals?” asks a villager in Devri Kalan. There are talks about creating an Adivasi-centric party and mobilising young Adivasis towards politics. Pathhargarhi in Madhya Pradesh has come up in two other districts apart from Dindori — Shivni and Mandala. As one moves from Dindori towards Jabalpur, scores of billboards in tribal dominated villages—Lakhan Masran, Barga, Kohani Devri, Devri Kalan, Sarvahi Mall, Ali Rajpur—have come up in the last three months. 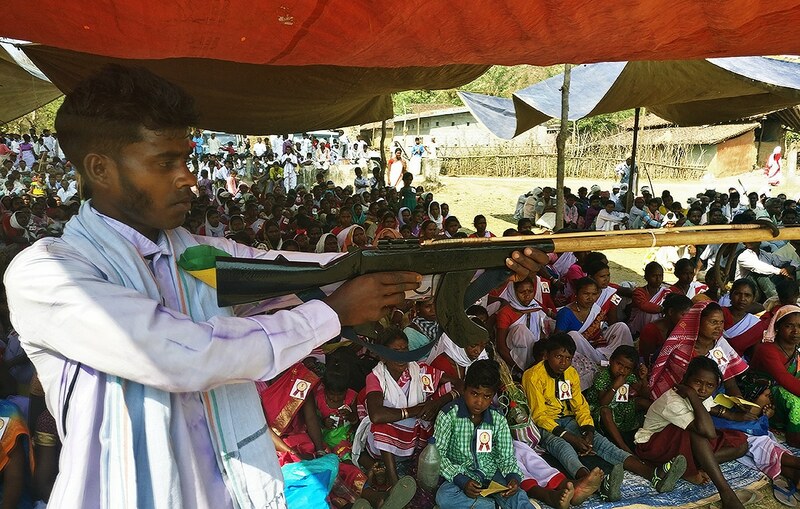 The movement is different from those happening in other states in that the tribals here aren’t too keen on an armed rebellion that will eventually take on the State. "Even the President of India and the Prime Minister are servants of the government that we own. " 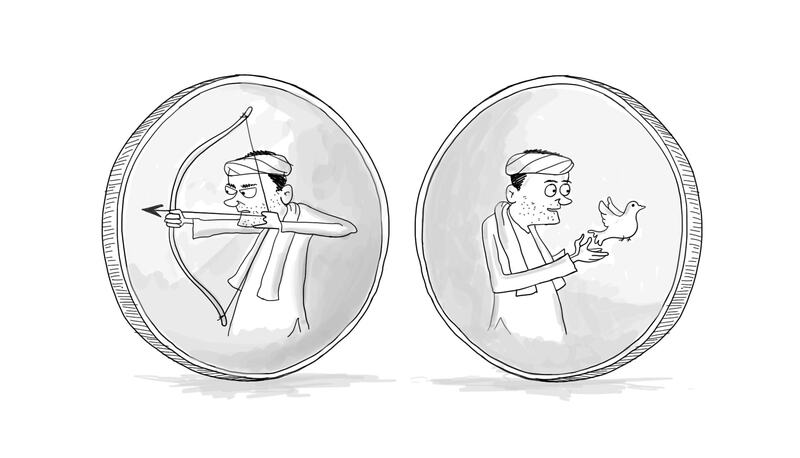 “See we only know that we don’t want to pick up weapons and fight with police the way they’re doing in Jharkhand. All we want is to be left alone,” says Harish, a local adivasi leader in Dindori. 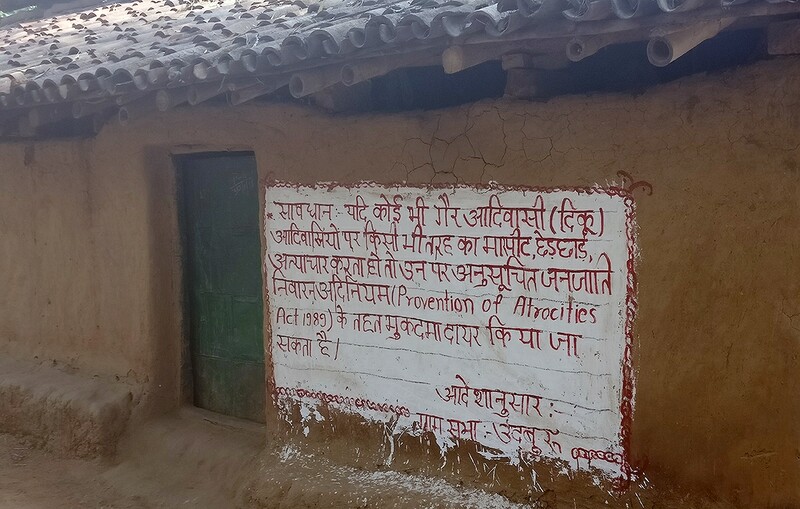 Two things have changed in these villages where Pathhargarhi has happened — they are reporting fewer cases to police, preferring to settle disputes within the village rather than get involved in a process they say they don’t understand, and institution of a toll tax system on “outsiders”. Every non-Adivasi who visits these villages, after securing permission from their gram sabhas, has to pay a toll tax according to their business interests, after making a detailed entry in a register. “Small traders like bangle-vendors have to pay Rs 10 per visit, bigger traders like those dealing in cattle have to pay Rs 50, and private construction firms have to pay Rs 250. We will use these funds to create a corpus that we’ll use to get things that the government hasn’t done for us,” says Jodha Singh Marawi, gram pradhan of Devri village. All these areas, where Pathhargarhi stones have begun to be laid, are peaceful right now. And this is how it was a year back when this movement had started in Jharkhand. And the conditions during the infancy of Pathhargarhi in both these areas were similar—rampant poverty, administrative neglect, a bloody history of state-versus-extreme Left violence, and a sense of being pushed around for the last seven decades—by big state projects like dams, or by big industries. It is hard to predict the future of this movement, but, at least the Adivasis feel, there is little to be hopeful about in the present.